Jute is a golden fiber of a Bangladesh. Bangladesh is holding the First position in producing Jute. Worlds 98% Jute producing in Bangladesh. 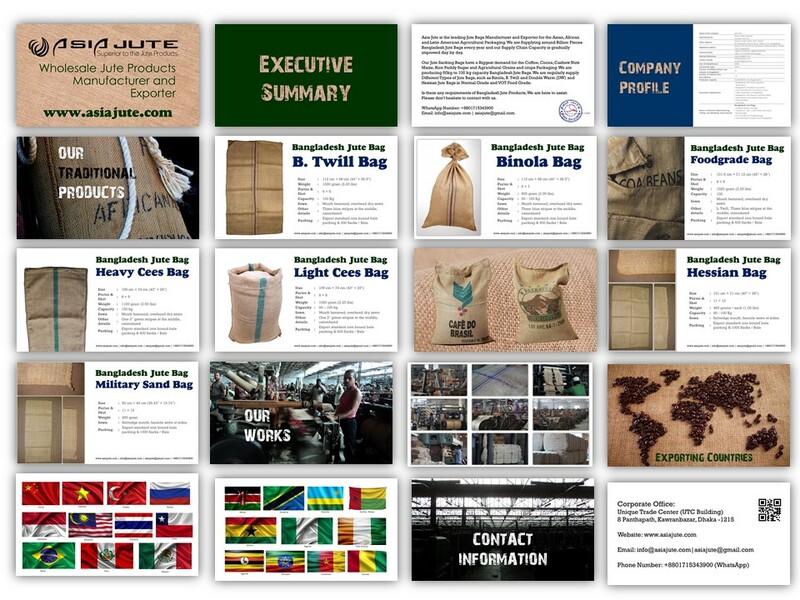 For that reason Bangladesh Standard Jute Bag is first choice of all Buyers and Importers. Day by day the demand of Jute made products are increasing. There is more than seventy percent of RH(Relative Humidity) present in the weather of Bangladesh which is a great positive atmosphere for producing Jute. To make Jute fiber it needs about more than seven cm of rainfall in the rainy season, and it occurs in Bangladesh. Cocoa beans, Coffee beans, Peanuts, Hazelnuts, Palm Kernels, Copra, Grains, Cereals, Cashew nuts, Shenuts, Shorgum, Gum Arabic, Maize, Wheat, Rice, Palm Kernels, Dry Copra etc. For making Standard Jute Bag one must have to woven it from the lower rank. And the lower rank of Jute Fabric is on hand as a weave diagonal line and basic. The demand of Standard Jute Bag or other Jute based product is increasing because of their environmental friendliness. Not only in few countries, demand of eco-friendly product’s are increasing globally. The Standard Jute Bag is of various types but up told are the most popular types of Jute Sacking Bags. The Jute Gunny Bags are highly capable bags. The Jute Gunny Bags are able to take even a hundred kilogram of weight for the needs. This bags are popular eco-friendly types of Bags. Standard Jute Bag despite of being environment friendly the Gunny Bags are really strong bag. Gunny Bags are available in different size and weight. The Jute Gunny Bags are biodegradable. Getting quality jute bags has become simpler and easier. Besides being eco-friendly, these bags are also attractive. The main reason behind this is that the bags come out in distinct colors which ensure they are optimally attractive. The bags are also available in different designs and sizes. Some of the most popular amongst these bags are the jute gunny bags. These bags if properly made they provide users with optimum value for their money. A-twill, B-twill, L-twill, fine twill cloth, D.W. salt, D.W. flour, Light Cees and Heavy Cees are some popular types of jute gunny bags. 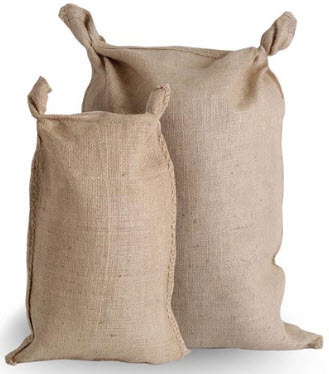 The strength and durability of jute sacks as well as the safety that the hydrocarbon-free ones offer make them truly dependable sacking material and worth the purchase of manufacturers and consumers. Main Use of this Standard Jute Bag is packing agricultural products such as Rice, Wheat, Paddy, Sugar, Coffee, Cocoa, Potato, Onions, Peanuts, Black Pepper, Seeds, Cotton etc. These sacking bags also use for dairy / poultry / cattle feeds packing. Used in agro – based industries for packing tobacco, tea, coffee, potatoes, sesame, wool, wheat, cocoa, sugar, pulses, grain, etc. and many other packing purpose. Ideal for use with hooks, having a stacking capability exceeding synthetic packages by far and being highly affordable, widely used in transportation and storage of grain. To prevent contamination of agro based products, it is also available in hydro carbon free form. We are a company that is environment conscious. Our range of Jute Hessian Bags are eco-friendly as a result of which it is extremely popular in the market. These bags are using for coffee, cocoa, potato, -onion, rice cashew nut and other similar grain packing.